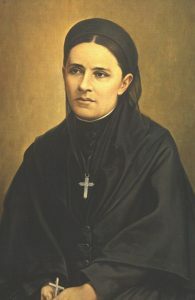 The Foundress of the Sisters of the Holy Family of Nazareth is Blessed Mary of Jesus the Good Shepherd, Frances Siedliska, who started the Congregation in Rome, Italy in 1875. Though born into a family of privilege and wealth in mid 19th century Poland, Frances hungered for a deep spiritual life that expressed itself in the radical commitment of vowed religious life. As she traveled through Europe seeking cures for her physical ailments, she eventually recognized and accepted God’s invitation to found a new congregation, and traveled to Rome in 1873, to seek the blessing of Pope Pius IX. Frances established her first community in Rome to emphasize her commitment to the universal Church. Strong was her desire to bring the love of Christ to any and all, she transcended ethnic boundaries, welcoming women of many nationalities into the Congregation, and serving God’s People in many different countries. Our charism, as expressed by our Foundress, is born of a deep contemplation of the Trinity and its human manifestation, the Holy Family of Nazareth. Like Mary and Joseph, faithfully living their daily lives in the presence of the Word made Flesh, our Foundress understood that simple ordinary life, lived in love, can be a profound encounter with God. Rooted in Christ, in cooperation with the Church, our Congregation strives, in the diversity of its ministries, to build communities of love and hope. We recognize the family as the place where values are nurtured and persons are formed, and in the spirit of Frances Siedliska, we work throughout the world to embrace the needs of the human family as our own. Frances took the religious name of Mary of Jesus the Good Shepherd. She was beatified in Rome on April 23, 1989 and at this time, just under 1500 Sisters in thirteen countries live with her animating spirit as their inspiration and motivation.